Singer/songwriter Lowry Hamner, a resident of Gulfport, Mississippi, joins a very select, privileged group of musicians who have been invited by Woody Guthrie’s daughter, Nora, to write music to Woody’s original lyrics. The inclusion of the song Union Air in Union Square on the new box set My Name is New York – Ramblin’ Around Woody Guthrie’s Town, issued on Sept. 23, 2014, is a success for Hamner that was many decades in the making. A previous release by the Woody Guthrie Foundation, The Live Wire : Woody Guthrie in Performance 1949 won a Grammy Award in the category ‘Best Historical Album.’ Guthrie was again nominated for a Grammy in the same category with the 2009 release of My Dusty Road on Rounder Records. 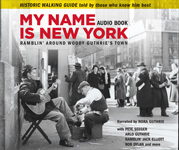 The new 3-CD Deluxe Audio Book includes two CDs that tell the story of Woody's years living in New York City, listing 19 historic locations where Woody lived and worked between 1940-1967. These stories are told by those who knew him best, in many different ways and through various encounters and circumstances by music partners: Pete Seeger; Ramblin' Jack Elliott; Sonny Terry; Bess Lomax Hawes; Woody's first wife Mary Guthrie; Woody's merchant marine buddy Jimmy Longhi; Bob Dylan; Woody's second wife Marjorie Guthrie; Arlo Guthrie; Nora Guthrie, and many others share their memories first-hand. Lowry Hamner’s song Union Air in Union Square is on Disc. 3, the bonus-CD of Woody’s music. Grammy award winner Nora Guthrie, Woody’s daughter and director of Woody Guthrie Publications, gave Lowry Hamner the lyrics originally written by Woody in 1943, and the singer/songwriter set it to his own composition in 2010. On the new box set Lowry is in the company of some amazing musicians of the folk musicians of the past and present, with luminaries like Woody Guthrie; Cisco Houston; Sonny Terry; Del McCoury; the Almanac Singers with Pete Seeger and Lee Hays; Ramblin’ Jack Elliott; Billy Bragg & Wilco and more. The song Union Air in Union Square is a testament to the long career of Hamner, originally from Terry, Mississippi, and the town from which bluesman Tommy Johnson also descended. Hamner is not new to music success. When he was a young man, in the early 1970s, he managed a music store in Meridian, Mississippi (which was also the hometown of country musician Jimmy Rogers). One day, he drove to Tupelo to see Sam Phillips, formerly of Sun Records, and his partner Ray Harris, of Hi Records fame. They had started a new production company, and Hamner pitched his songs and even recorded sessions for Sam Phillips, who also recorded Elvis Presley and many of the greats of blues and rock-and-roll. Phillips told Hamner, "You don't sing like Elvis, but you're the best songwriter I've heard in ten years." 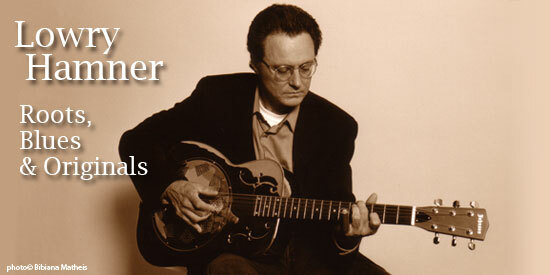 Equally versed as a fingerpicker and slide player, Hamner’s approach to songwriting is rooted in a lifelong intrinsic connection to Southern music, country and blues. He pays passionate, reverent homage to the old music of the region, and his own compositions are lyrically poignant and musically powerful and expressive, yet sensitive and heartfelt. There is an ethereal, gritty feeling and profoundly moving sincerity and authenticity to Hamner’s music.